It was great to hit New York for the weekend a few weeks back and all for a good cause too. Being stuck in studio in Cork 4 days a week didn’t make it easy, especially when the Sunday night flights gets into to Shannon at 7am and we are in the office at 9. I couldn’t wait for the show to finish that evening; I was halfway to my bed before the credits were off the screen. 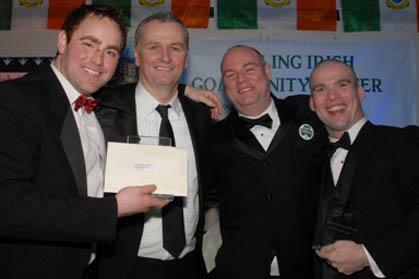 As you may know the Aisling Irish Centre invited me over to host The Bachelor of New York 2013 and what a night it was. I hadn’t been in Gaelic Park in years. It was like the Hillgrove night club in Dingle on a bank holiday weekend, the place was packed and people were there from all over Ireland. We had 10 guys, Irish and Irish Americans, in for the title and it was firefighter Brian Downey who rose to the top of the bunch. With work early Monday morning in Ireland I wasn’t in much form for conversation on the plane home. This lady sat next to me and introduced herself, I did likewise. Conservation started and I was being short with her. After a while I was feeling bad about this and started chatting again. She said that she was on her way from San Diego home to Ireland for the funeral of her brother who had passed away after a short illness. I felt worse about being short with her after this. She was a lady and a lady who knew her movies so we both piped down and watched a film. I am a man who likes a bet. We had film director David Puttnam on our show a few weeks back, David was an Oscar winner with the epic film that is ‘The Chariots of Fire.’ He also has a vote for the Oscars; I never met anyone with this power before and I was excited. He said Daniel Day Lewis would win the best actor and he was correct. He also said that the movie he starred in, ‘Lincoln,’ would take the best movie award, but as we know Argo did the job in this category. After seeing both these movies on the way over and back on the flight I certainly agreed with Puttnam about Daniel Day in his role as Lincoln, but I did find the movie very long. I thought Argo was brilliant and to the point, where you learn more about Iran in the first 3 minutes than 12 years of school history. I have to say though as David was telling us what should win on the show, all I could think of is that I could make a few bob out of this. The odds for a double here didn’t do it for me so I decided to put a few more into the bet to plum the overall accumulator up, I was getting greedy! I moved into field I don’t know that much about, rugby! I backed France to beat England and Ireland to beat Scotland, both losers. So my bet was well gone on Sunday by the time Ben Affleck was making his acceptance speech for Argo. I also had Galway to bet Kilkenny in the hurling in there, I should have backed them on their own. It was a great start by the Tribesmen and might be worth backing for the Championship this year. Anyway there you have it; greed doesn’t suit me!